Read here how a religious school that has received more than $6.5 million in public voucher money is trying to fire a 15-year veteran teacher because she is married to a woman. Below are three things you can do today to support and improve public schools. 1. Send a letter to your senators asking that they oppose the appointment of Brett Kavanaugh to the Supreme Court. He has a clear record of supporting publicly funded vouchers going to religious schools. He (Kavanaugh) was part of the legal team that represented former Gov. Jeb Bush of Florida in 2000 when he defended a school voucher program that was later ruled unconstitutional. School voucher champions see Judge Kavanaugh as a critical vote in overturning longstanding constitutional prohibitions, often called Blaine Amendments, that outlaw government funding of religious institutions in more than three dozen states. We make it easy to send your email. Just click here. 2. Add your name to this petition to tell Betsy DeVos that money intended to enrich children’s education should not be used to fund guns for teachers. Yes, it is outrageous, but that is what she is proposing: using federal funds intended for academics and enrichment to arm teachers! Add your name to the petition, which you can find here. 3. Register to attend our 5th Annual Conference on October 20-21 in Indianapolis. Please register here and do not wait. Reduced rate hotel rooms are almost gone. If you need help with costs, on a limited basis, we can provide it. Just apply for a scholarship here. Take a moment to look at our exciting keynote and panel speakers. It is at the grassroots level that the pushback against corporate reform began, and our conference is where grassroots groups meet. 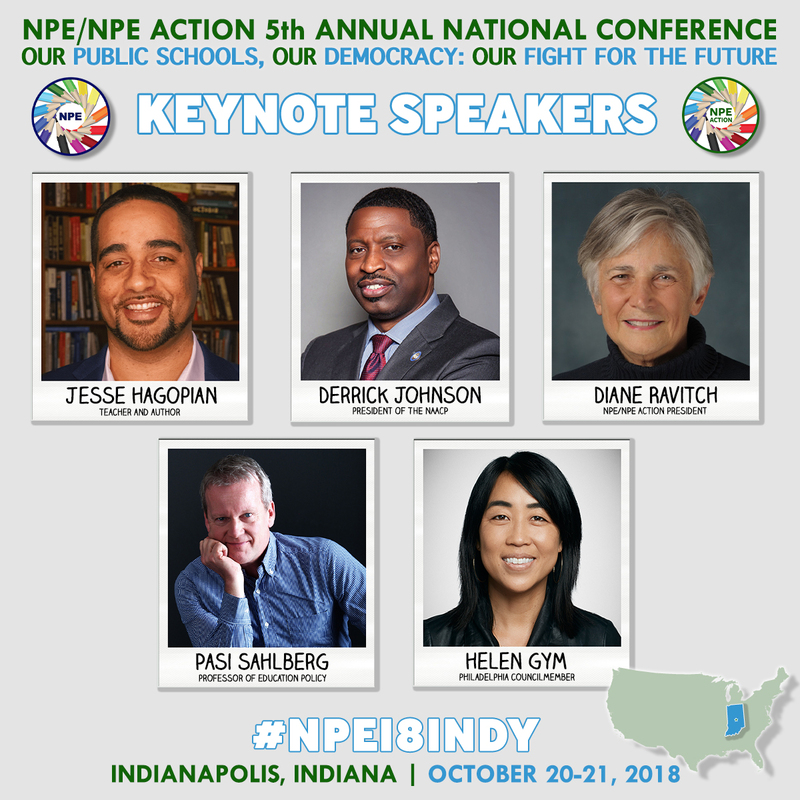 During the fall expect to see our NPE Action candidate endorsements for the November elections. We hold our endorsed candidates to high standards regarding their positions on public education. We will also be publishing a compelling report shortly after Labor Day that shows how millions upon millions of dollars, often in dark money, flow to candidates from those who do not believe in the democratic governance of public schools. All of our work on behalf of public education costs money. We need your help. Please make a donation to support our work here.